Interactive work by Fred Périé. A performance as in movies, where action and perception, existence and consciousness, character and figure, play and images are all seen as indivisible. The installation at first resembles a classic screening : seats positioned in front of a blank screen. There is, however, a video camera on a tripod pointing toward the seats. When the projection begins, the image of the empty seats slowly appears. After a while, the spectator begins to realize that his own image is revealed when he moves, but vanishes when he is stationary. The spectators start to move about, to play with the representation of their own bodies, and then with that of the others. 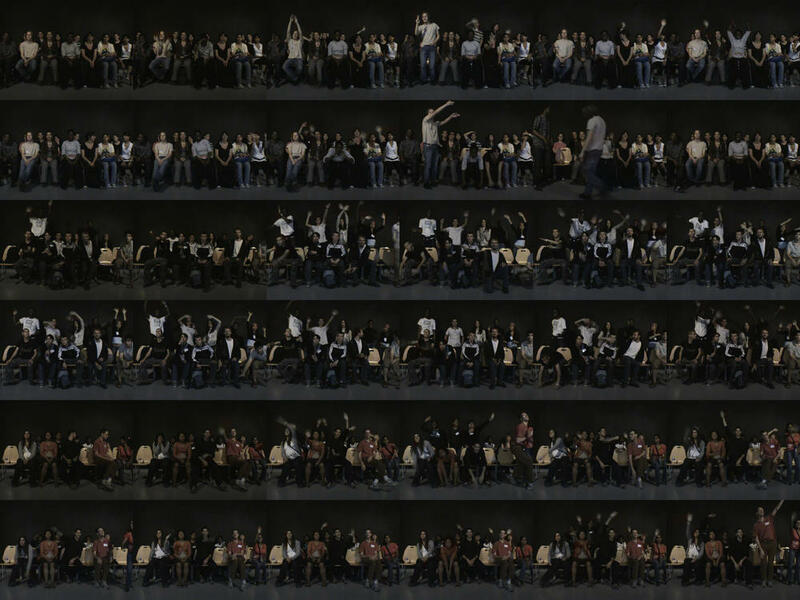 The audience forms a part of the process as if it was the image. The sequences follows a non narrative scenario with intertitles, that play an articulative and indicative role and suggest that what’s in question is not exactly a game. Gradually, other images - stills or video footage, realistic or abstract - come into play with the aim of forming an autonomous symbolic and pictorial object. Each spectator becomes an actor of a collective and abstract image, other: the image as an extension of bodies and these bodies extensions of thoughts. All the while the image remains fragile and ephemeral. “Is it possible that this is us ?” "is it here ?"